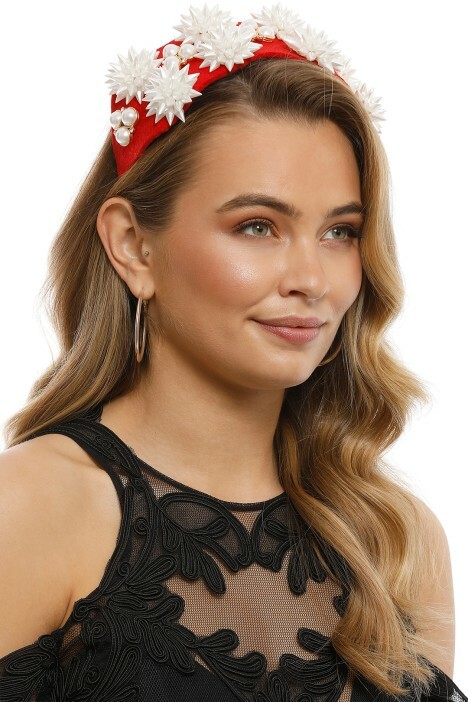 Set on a red velvet headband, the Maya fascinator is feminine yet strong, with just the right amount of regal glamour to turn heads at your next race-day event! With dainty pearl trims and elegant gold finishings, you’ll be sure to turn heads in this iconic headpiece. Pair this stunning headpiece with a lavish lace midi dress and a killer heel for ultimate impact! Before you rent, you can read some of the fantastic customer stories on our blog to get more style tips from women just like you! Established in 2012, Studio Aniss pushed the boundaries of hats through new technologies and innovative materials. Bringing world-class design, a free spirit and a clear vision that uplifts confidence and clarity that causes GlamCorner to be filled with excitement for their collection. Winning a series of exclusive millinery awards, we believe Studio Aniss has stayed true to their intentions in gathering elegance, quality and character to their creations.